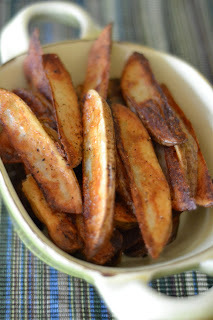 The World in My Kitchen: Finally...Crispy Oven Fries! I have a love/hate relationship with potatoes. I love to eat them; I'm terrible at cooking them. I make a mean mashed potato, but I can never get potato pancakes to crisp or oven fries to crunch...until now. I stumbled across this recipe for Crispy Oven-Baked Potato Fries a few weeks ago at The Comfort of Cooking, and now I have a go-to recipe for homemade fries without all of the grease from a deep fryer. These were delicious with just some salt and pepper, but I will surely experiment with other herbs and spices in the future. Drain the potatoes. Spread the wedges out on layers of paper towels or on clean kitchen towels. Pat dry with additional towels. Wipe out the now empty bowl so it is dry. Return the potatoes to the bowl and toss with the remaining 1 tablespoon of oil. Arrange the potato wedges on the prepared baking sheet in a single layer. Cover tightly with foil and bake for 5 minutes. Remove the foil and continue to bake until the bottoms of the potatoes are spotty golden brown, 12-20 minutes, rotating the baking sheet after 7 minutes. Using a metal spatula and tongs, flip each potato wedge keeping them in a single layer. Continue baking until the fries are golden and crisp, 5-10 minutes. Rotate the pan as needed to ensure even browning. I love doing my fries like this too! I found the recipe in Cook's Illustrated Light cookbook. You get the crispy crunch of a fried potato without the gallons of hot oil to deal with. I'll bet you could toss them with seasoning like creole or steak seasoning too. What do you think? Perfect! Thanks for the recipe. I always make oven fries but I always wish they were crispier. I also recently read that if you run the potatoes under cold water until the water runs clear, that gets the excess starch off of them and I think that allows them to crisp up as well. I guess that's the same idea as letting them soak but maybe it would be quicker? Danielle, it might work. As I mentioned, I'm kind of terrible at crisping up potatoes! ;-) The hot water was definitely starchy when I drained the potatoes. The one thing the soaking might do is keep the moisture inside to steam the potato while crisping in the oven. Let me know if you try the cold-water method, though. It would be nice to cut the prep time down a little with this recipe. Mahalo for sharing. I was wondering how to make the fries crispy using the oven method. I definitely prefer my fries this way! I hardly ever fry them in any oil! A friend of mine told me to soak the potatoes in warm water with sugar for 10-15 mins.1/3 cup sugar for 2 cups of warm water,then drain and pat dry.Add salt and pepper or seasonings and bake.It will make your fries really crispy.